One of the most useful features of Windows 7 for business laptop users is automatic default printer switching based on location. In past versions of Windows it was only possible to have one default printer. In Window 7, you can set default printers based on location. For example, when you are at work your default printer is set to the big multi-function network printer but when you go home your default printer is automatically switched to your local ink jet printer. Then, select one of your printers with your mouse. Click the Manage default printers button on the toolbar. 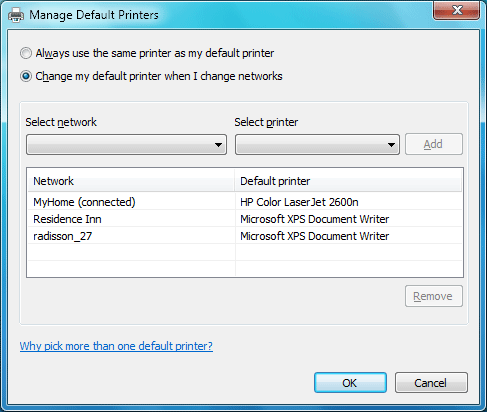 Make sure Change my default printer when I change networks is selected. Then, select the network from the drop down list and then select the printer you want to use on that connection. When finished hit Add.